I'm a sucker for pretty flowers- real, imagined or otherwise. Perhaps that's why I emailed Kelly Bermudez the moment I saw her simply beautiful watercolor piece, Blue Fields of Love. 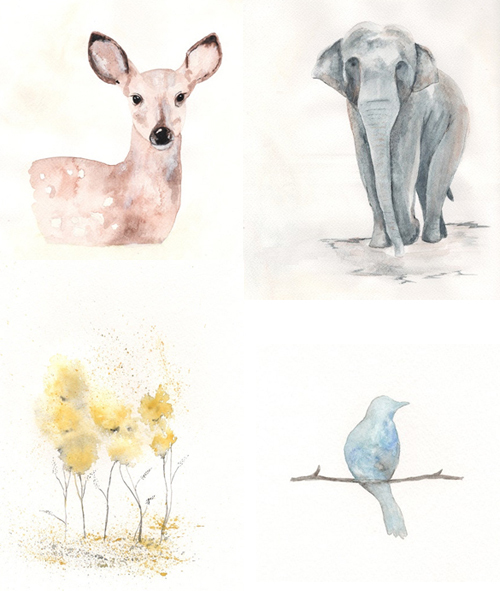 Kelly, based in Fayetteville, North Carolina, describes her Etsy shop of watercolor paintings as "my journal or diary." Adding, "I want each of my paintings to have depth and meaning behind them." Kelly found inspiration for this watercolor of wrens in an Ecclesiastes quote, "Two people are better off than one, for they can help each other succeed."